Hey, New Zealand, we'll concede that you guys invented pavlova if you'll concede that we made it famous, okay? You know, just like Russell Crowe. 1. For the meringue, beat the egg whites to soft peaks. Add the sugar a teaspoon at a time and continue to beat until glossy. About halfway through adding the sugar, stir the cornflour and cream of tartar into the mixture, then continue adding the sugar. Continue to beat for about 10 minutes, until you can no longer feel any sugar granules when you rub the mixture between your fingers. 2. Heat your oven to 110°C. Spread the mixture onto a lined baking sheet to a thickness of about 5cm and bake for around 75 minutes. Allow to cool completely in the oven, then cut into 5cm pieces. 3. Whip the cream to soft peaks and transfer to a piping bag. Divide the pavlova pieces between 8 jars or attractive cups and pipe a little of the cream inside. 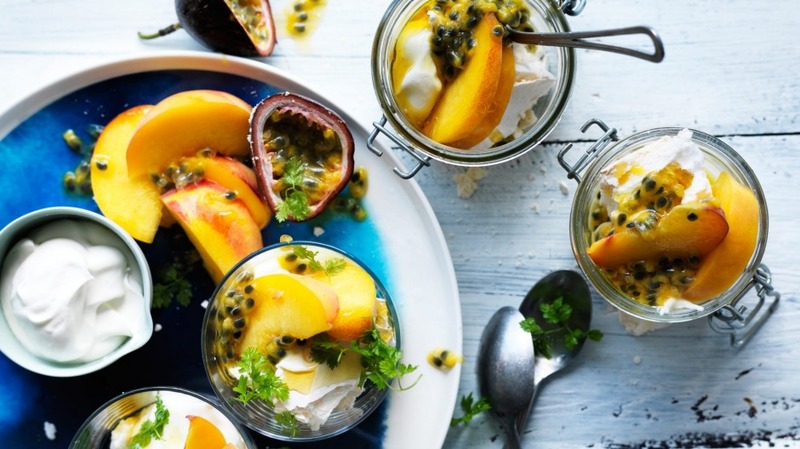 Arrange the peach slices and passionfruit on top and drizzle with a little golden syrup. Add a few sprigs of chervil or mint to serve. Adam's tip: You could always make a regular pavlova, but desserts in jars or glasses look great. Prepare them ahead of time and just keep them in the fridge ready to serve. If you entertain reasonably often, a set of 10-15 attractive jars is a worthwhile investment.